(CNS): How to negotiate a roundabout correctly and safely will be one of a number of topics that will be address during the latest special driving school hosted by Streetskills. Next week, drivers of all ages can view practical demonstrations of safe driving techniques, accident-prevention measures and proper auto equipment. The theme of this month’s programme is Road Craft. Segments are intended to educate drivers on issues ranging from tyre choices and pressures to the mechanics of safe driving. Road Craft will also include advice and guidance on the consequences of speeding, and driving in inclement weather. Officials said this summertime topic was chosen to cater to motorists, especially new or young drivers, who may need to navigate roads during rainy conditions. This National Road Safety Strategy (NRSS) initiative will be held from 4 to 5:00pm at the Department of Vehicle and Drivers Licensing (DVDL) compound, across from the Lions’ Centre. The presentation team will include DVDL Assistant Manager Stephen Quinland and RCIPS staff. A representative from Saxon Insurance Company will also discuss the importance of having appropriate auto coverage. The session will also be videotaped and broadcast as a GIS Spotlight TV segment during August. The NRSS’ monthly focus on safetybegan in April and has so far addressed cell phone use by motorists, and pressures regularly experienced by youthful drivers. Streetskills is the education component of NRSS. It is an interagency initiative which has the support and active involvement of the private sector – namely the Cayman Islands Road Safety Advisory Council (CIRSAC). The remaining two components are engineering (road construction, maintenance and signage); and enforcement (traffic safety and the detection of driving offences). Folks there is also no need to stop at a roundabout when there is clearly nothing already on the roundabout coming from the right you're going to get rear ended and suffer whiplash with this behaviour. One concern that will get somebody killed is the clowns who stay in the left hand lane even when turning right on a roundabout, you are cutting other drivers up common sense must prevail, if you turn right at traffic lights you get in the right hand lane same applies at roundabouts. ps – Cyclists drive on the left and get some lights, you are putting your life at risk. Can I suggest that the cops be given lessons in how to use the roundabouts, I went to town the other day behind one which passed through at least 4 round abouts without using their indicators. It seems the most confusing thing about the roundabout by Lantern point is which lane motorist should be in if they are going toward Ocean Club. I think most drivers think if they stay on the left then they have the right of way but it is all dependent on where you entered and where you are going to exit the roundabout. If I am coming from town, the Ocean club exit is three exits away, so I should be on the inner lane. If I am going on the Bypass that is two exits away so I should be in the outer lane. If I am already on the roundabout in the inner lane and heading toward Ocean Club and a car coming from Prospect enters the roundabout on outer laneat the same time and is also going to Ocean club, they should in fact give me right of way to exit but most of them continuing driving thinking that I am "cutting them off" by being on the inner lane so every time I am exiting from the inner lane I always look to make sure some idiot is not in the left lane speeding up trying to exit before I do. You must yield to oncoming traffic (especially idiots) before you enter the traffic circle. Oops. I am afraid I gave you a thumbs down before I read your post properly. I agree with most of what you say. However, in your example I believe you should be on the inner lane unless you are taking the very next exit in which case you move to the outer lane. This works perfectly if everyone follows it. This is a great idea except that they should have it at a more convenient time and multiple times that so that as many people as possible can attend! Clearly from the commentary there are varying interpretations of how to navigate a roundabout. So I am going to add my 10 cents. If you are exiting on the 3rd of 4th exit, you should be in the inner lane (right lane) BUT when you are preparing to exit, it is your responsibility to use caution and your side mirrors to ensure that the left lane is clear and safe to exit. Motorists on the left lane, it is your responsibility to be courteous and give way to people on the right and not go plowing through thinking you have the right of way because you are on the left. Another pet peeve of mine is the usage of the roundabouts (yes people, they are roundabouts, despite their size) at the Airport junction and the one in front of Mirco Centre. The one at the Airport junction is being used like a three-way stop. It is a roundabout and the rule is to give way to the motorist on your right, not sit and wait because you think the person on your left got there first! The one at the Mirco centre is being used as two main lanes (coming from CUC direction and from the Butterfield roundabout) and two side rounds (coming out from Mirco and coming from out from dump road). If motorists would take the time and notice that there are traffic signs posted from all four directions indicating that it is a roundabout and to give way to the right. I almost got wiped out the other day while turning into Mirco because the person coming from CUC direction thought he had the right of way because he was going straight and he was on the left. Also, clearly people in Cayman are not familiar with merge lanes. The people in a merge lane are not doing anything illegal, they are in the merge lane waiting to merge, why is it that so many motorists speed up to avoid letting the motorist in the merge lane in? This is petty and dangerous. The merge lane on Bobby Thompson way is popular for this kind of behaviour. Sorry you were doing so well until you used the word "courteous" — on this island!! First come has right of way allways. IMHO, the worst thing GC could do is put a round-a-bout at the airport. Tourists are just getting used to driving on the left after picking up their rental car (usually after a long flight) and boom, they hit a round-a-bout. A stop gives a tourist time to adjust, think, move….a round-a-bout puts them in a panic right off the bat. Plus, it is a small round-a-bout to boot, unlike the larger ones where traffic seems to just move with the flow. This one…right at the airport is confusing as it is just a little circle thing. And, btw, I am used to driving around rotaries….and this one still gets my nerves going immediately after arrival. Give them some credit. There are roundabouts in the rest of the world. It's Cayman's motorists that seem to be new to these. How many people can take off from work and attend this seminar being held from 4:00 – 5:00 pm? Well – based on all these comments it's obvious that ppl have different interpitations on how a roundabout should be used. I think the seminar is a good idea but doubt it will help as some ppl don't even know or want to use an INDICATOR – which is key when on a roundabout! Replace the Butterfield Roundabout (and all major roundabouts in Cayman) with traffic lights. It might cost extra $$$ but will save a lot of accidents and possible deaths. An accident at a traffic light is much more likely to be fatal than an accident at a roundabout. Fact. 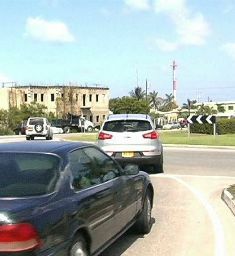 Butterfield Roundabout (and if possible, all major roundabouts in Cayman) need to be replaced with traffic lights to avoid accidents and may be deaths. Chairman of the Road Safety Committee, Royal Cayman Islands Police Chief Superintendent John Jones needs to speak to his staff that were driving illegally through Industrial Park Wednesday afternoon with blue flashing lights on just because they were pulling a boat, the trailer for which had no working lights. How can this man deem to tell the rest of us how to drive when he cannot ensure his own staff drive correctly or even legally! These Police clowns have done it again! Today they pulled the empty boat trailer through Industrial Park with blue flashing lights on and the driver not wearing his seat belt. Can you imaging when they got to the roundabout all the other traffic stopping just to let them through. Drive how you want folks obviously the Cayman Islands Police ( I refused to use the title Royal) do. Seriously who here actually cares!!! The key point missing from all comments so far is that one should never overtake whilst in a two lane roundabout. Even if the inside lane is shorter, one should slow down to maintain relative position with a vehicle in the outside lane. If there's one thing that's clear from all of the comments it's that there are a lot of opinions on how to use a round-a-bout! No wonder they're so dangerous (we've actual dubbed the Butterfield roundabout the "Wheel of Death" in our household because of the number of times we've almost been wiped out on it). We all need to be on the same page. Could there be some kind of education program? Some ads on the television, at the movies, and in the papers. It might clear up some of the confusion. It is interesting to read the various comments which shows the variations of understanding. So I will add mine. EVERY VEHICLE USING A ROUNDABOUT SHOULD BE INDICATING. That way there is no debate about a drivers intentions. It is quite simple. Taking the FIRST exit – indicate left all the time. Regardless of where the first exit is. Taking ANY OTHER exit – start off indicating right, continue doing so until you approach the exit you intend to use, then indicate left. This change is best done as you pass the exit before yours. This works on large or small roundabouts and it does not matter how many entry/exit points there are. You just have to make the changes quicker on the mini ones. By following these two simple rules every other driver is fully aware of what you are doing and if they need to give way or not. That is: (a) vehicle approaching from my right indicating left – I can proceed as they are exiting where I am entering from; (b) vehicle approaching from my right indicating right – I give way as they are passing across the front of me. I think this is what folks may call the Austrialian way. I don't know, never been there and I am Caymanian. All I do know is that if I am hit on a roundabout it is going to be the other persons fault as I will always be indicating so they cannot say they did not know my intentions. Lane selection and staying in the lane is another story. Good luck with this education programme as it is really needed. No, you are giving the wrong advice. You DO NOT indicate, when "starting off", when going straight ahead at a roundabout. You only start to indicate once you have passed the exit immediately before you exit straight ahead. I have seen numb nuts indicating right in the outside line (and inside lane) when going straight ahead – what complete morons. You are giving people who are driving in the inside lane (going straight ahead) a heart attack when they see you indicating right cause people who know how to use roundabout think you are going all the way around (and who sometimes do go all the way around) My goodness it is not DIFFICULT people. Use your common sense, but I suppose that is asking too much. And I know a British person who should know better who does the above. If everyone who intends to take the first left at a roundabout indicates then traffic would flow a lot smoother. Does the NRA really have to put signs up like the one at the airport roundabout saying "indicate left turns"!! If you are one the people who can't be bothered to indicate, may I ask you a question, does it not infuriate you when have to stop unecessarily because some t**t like you doesn't indicate. The only time you have to use your indicators is when the NRA say "indicate left turns" otherwise they wouldnt have told you too would they? Indicating intentions before, during, and after, is just fine with me considering less than 10% of motorists currently know what indicators are. Can you not make a comment without being insulting and calling people names? As I took the time to give my opinion do I appear to be "a t**t who can't be bothered to indicate"? Based on your opinion I am indicating too much! Now that is interesting. As for the "straight on" discussion which I have had with many friends, how does the driver waiting at the first entrance you pass know what you are doing if you do not signal it? What if "straight on" is not the 2nd exit? Given that 90% of drivers do not indicate at all, I prefer to err on the side of caution and indicate ALL OF THE TIME. BTW, the driver in the inner lane would have to be behind me to see my right indicator and then they would also see my left indicator in plenty of time to avoid a heart attack. I do agree that with your comments about persons using the outside lane and travelling more than 2 exits or all the way around. Some of whom never indicate at all. The NRA sign at the airport is indeed really silly. The simpler the rules can be made the more likely people will follow them and they need to apply in ALL circumstances, regardless of number of exits or size of roundabout. Make taxi drivers attend! Most of them have no clue how to use a roundabout. Of course not – they're busy trying to work out how much they can get away with ripping off their passengers. Are they the only taxis on the planet without meters? Oh come on guys …this is not rocket science nor it is algebra. Even grannies have a better idea on what roundabouts are about. Let's not waste time discussing non-sense all day when we have an economy to rescue my fellow caymanians. Cops should park at the Butterfield roundabout for an hour a day, pull over everyone that does it wrong and force them to attend this class! Every single day I see people entering the roundabout in the outside lane and then continuing round completely ignoring the people trying to exit from the inside lane, and other people entering the inside lane and taking the first exit. The other day I came onto the inside lane to take the second exit. As I went past the first exit a lady entered into the outside laneand drove straight across the exit I was trying to take. I had to lock up and slid off the road….and then she started making rude gestures at me! It's scary to think that woman is still driving around Cayman thinking everyone has to give way to her. Outside lane gives way to inside lane. That's all you need to know. As for dual carriageways…I actually started to wonder whether the right hand lane is the slow lane in Cayman. It's pretty obvious from the way people drive here that a lot of them simply have no idea what the rules are. You can flash your lights at a slow driver in the right lane and they look at you with total bewilderment. Anon 0946 what happens when two cars are going around the round about side by side and the driver of the inner car decides he wants to move to the other lane? I have been cut off many times by drivers driving like that in evening traffic. I am inclined to think that a major part of the problem at round abouts are not how to drive them, its that some just dont care. You just gave an example of that lady and there are numerous such examples. You don't change lanes once you're on the roundabout! You carry on around in your lane, or you exit. If you're in the outside lane you don't drive across exits so you should never cut anyone off. Anon 1706 when I enter the round about I go to the inner lane if I am not using the next exit. If I am then exiting at the second exit exactly how do I get off the round about without changing lanes???? You should not be exiting from the inside lane. As you pass the exit before the one you intend to take you should indicate left and move over to the outside lane ready to exit. Cars on the inside lane have no priority to cut across the outside lane in order to exit. If the woman you accuse was going straight ahead, she was correct to be in the outside lane. You were in the wrong. Wrong. You do exit from the inside lane. Since people in the outside lane should be taking their first exit it shouldn't cause a problem. Anon 1417 lets take for example the last round about going east at the start of the Ocean Club straight. I am coming from town. Carsexiting either towards Prospect or the Newlands Bypass usually take the left lane and those going to the Ocean Club straight takes the right. It is a disaster waiting to happen there are cars getting in the left lane and going all the way to the Ocean Club Straight and there are cars getting in the right lane going to the bypass. I go in the left lane and exit on the bypass as most people do. Everyone on the round-abouts that come from countries which have had them in place 30 years or more has no problem. Its the new drivers, drivers from other Caribbean destinations & countries where this type of traffic control is little used that cause the accidents. Also the local Police officers could do with a lesson in traffic law, as it relates to round-abouts. Some have no idea….which becomes apparent when they go to court, to attempt prosecution. Disagree with you – sorry. People from other places adopt our bad habits as soon as they hit the road here. UK policemen as well! I agree with the first post that if police or even better, traffic wardens, were at the roundabouts giving tickets to everyone who breaks the law, they could make a fortune. This could also apply to cell phone use, lack of car seats for kids, lack of seat belts, leaving L plates on permanently and I could go on…………….. Make some money out of these fools please RCIP. Firstly, Brits (Yes I'm one) the roundabout laws here are different. Look up the NRA method & your find its like in OZ. I only say as one "Charming" British Gent I know flashed honked & shouted abuse atme for cutting him off on the Butterfield roundabout. When he realised who I was he stopped and apologised. He then became very red faced when I showed him the correct rules. Secondly yes most people need to learn how to use roundabouts. – THEY ARE NOT 4 WAY STOPS!!!!!!!! Sorry this infuriates me especially when you have people who crash into you because they don't know how roundabouts work and don't give way to the right. What's worse – the police don't always know either. I think anyone who wants a licence here should be shown how roundabouts work if they are not from cayman. Finally yes they need to make talking on your cell and driving illegal ASAP. And fine people when they spot it. likewise the police need to led by example – buckling up & not using their phones. People coming here from certain countries where the driving is known to be deplorable and third world countries, should have to take a test before they can get a licence here. The police should be included too. They are some of the worst drivers out there. Besides it will give them something to do while sitting around waiting for the gun criminals to hand in their weapons. What I like to do is brake late begin the turn in load up the right suspension relase the brake swing the steering hard right clip the apex and while accelerating hard, on the end of adhesion, power out on the other side. This should be mandatory for everyone (or at least people who come from countries without roundabouts), the standard of driving on this Island is stunningly bad. Number one; put down the cell phone. You can't operate the indicators while holding a cell phone. Just tell the other party, Im coming to a roundabout and put the phone down. You cannot steer a car properly around a mini roundabout without using both hands. Put the cell phone down. Next week: How to navigate a roundabout while texting your baby momma. Nothing wrong with roundabouts, only with the people who will not use them properly. Basic rule, signal when entering a roundabout, signal when exiting. Give the rest of us a chance to anticipate your next action. -Using the left turn signal to go all the way around the roundabout just because they are turning their steering wheel left! These are just a few ignorant, dangerous uses of the roundabout at the top of my head. There are many, many more that must be addressed in order to make Cayman a safer place on the roads. I would suggest introducing a graduated licencing program with enough *qualified* driving instructors to allow the program to run smoothly without months of backlog. Young men always seem to take the brunt of the blame for the cause of the accidents, however this is not just a Caymanian occurence but a worldwide one. I do agree that more education on safe driving should be introduced to the school children at 16 years of age, and make it mandatory for the young men and women to spend x amount of hours with a qualified instructor prior to being able to sit the test – because if I am being honest, the parents teaching these young adults to drive are themselves poor drivers. A poor teacher is bound to make a poor student without other, hopefully more qualified, input. The "signalling when entering" rule is not right – in fact it is dangerous. One signals left when entering and going left. One signals right when entering to go right. One should not signal when entering to go straight ahead, one should only signal when leaving. The Highway Code is clear on this. It would help if the Police would follow their own counsel and use their indicators. Setting an example is always a good plan if you intend to instruct others. I suggest that a series of instructional videos be created and distributed via Youtube.com. The NRA needs to paint arrows in the roads at roundabouts because many people have NO idea how to use them. I would like to posta link to the Highway Code (Graham Walkers book also sets it out clearly) but the technology defeats me. Can someone else do it so we can stop people in the outside lane going all the way around to the third exit? I saw a former Minister of Government do it recently and when I spoke to him he said I was wrong. I sent him the Code; no response. Let's hope they don't give the wrong advice that is in the New Resident maagzine about roundabouts. It says one should indicate right when entering a roundabout and going straight on. That is correct advice, isn't it? Indicate left if you're taking the first exit, indicate right if taking any other exit, then indicate left as soon as you've passed the exit before yours. Not rocket surgery. Correct, you do not indicate right when going straight on. Going left? Indicate left. Going right? Indicate right. By deduction when someone is not indicating guess where they are going? Thats correct! Straight on! Clap clap, gold star etc. One slight problem with that – most do not indicate. So i do understand why in some circumstances you might want to indicate a quick right e.g leaving the camana bay section of the bypass and heading north and you come across the roundabout at the fidelity building – if you are in the left lane and continuing on the by-pass (which you can do by the way – the UK highway code recommends in such a situation everyone should be in the left lane unless traffic is busy and two lanes is required – plus two lanes in, two lanes out – read the NRA brochures i have posted below), everyone seems to think you are heading left. It appears better to flip a quick right if you are in that left hand lane here so those coming off westbay road know you are going straight on. Why you do not indicate right? Here is why. The roundabout on westbay road next to the fidelity building (adjacent to the one mentioned above). If you come out of the small plaza behind the fidelity building where the Havana Club is situated and want to turn right, it is easier to go left and do a 360 on the roundabout (or if you live on that small road and are heading south and simply want to get home). Because everyone seems to think fit to indicate right here, when you do indicate right and actually go right, pretty much everyone heading north decides just to plough on and try to play a bit of munch the metal with your car. This is the clearest, simplest, example of why you do not indicate right at a roundabout when going straight ahead, especially a one lane roundabout. Not to mention (on a more minor point and really moot as the example above demonstrates) if you do indicate right then go straight ahead, those in the entrance to the roundabout you are indicating to pass (but then take the exit before) end up stopping, thereby making the whole point of a roundabout pointless – it is to keep traffic flowing. Ehat else? Common sense! Use it. Drive defensively! Always assume that other driver is going to do the wrong thing, and approach and use a roundabout safely. I have been cut up numerous times with people in the left lane on a roundabout turning right when i am going straight on but by driving defensively i avoid them. Just because they cut you up does not mean you have to crash into them – you go right as well and do a 360 until your lane comes up again. Good opportunity for you both to shake your fists and beep your horns at each other for a laugh as well. Other than that, may I suggest everyone reads the NRA brochures. The NRA agrees with us on the above points, and are they not the authority here and we should therefore be following their wisdom?Clearly marked that you do not indicate left or right when going straight ahead. Indicate left when you are approaching your exit lane in all circumstances. Never switch lanes on a roundabout. All in the brochures. The only problem with the comprehensive brouchure is that is contradicts itself by showing on a two lane roundabout you can use both lanes to go straight ahead. Then in the blurb it states the outer (left) lane is for short left turns only. But the pictures are correct. Even if you dont agree with the NRA brochure pictures, if everyone followed them (which you are supposed to do by the way so if you disagree with the NRA you are just being bad boys and girls, aren't we? ), we would all be on common ground. Wouldn't that be nice? CNS – i recommend you have a permanent link to the NRA brochures clearly posted on your site. This site does not allow me to post them here. A quick search for NRA cayman brings you to their site, and the link is at the bottom of the page. I guess the problem is this would not be read by those that actually need them. Ah well! Yes, spot the Brit. We, of course, are always right when it comes to these things ;-). And since I also happen to agree with the NRA….good chance then it is correct? End of lesson. Now re-read and learn. Indicate?What part of the word indicate do most people understand?, none .They have no idea how to indicate.Most people on this island have no use of the turn signal on thier steering wheel.You can be waiting at a T junction waiting to go right, and cars are comming at you from the right,how many times have you could have gone if only they indicated that they where turning right on the same street that you are waiting for them to go straight,this really irks me. As far as rounabouts go , when you have a dual rounabout with a single exit who has the right-away .If you said the guy on the inside can cut you off and be right then I say thats bull.Same reasoning ….on a straight road with two lanes …the person on the right can cut you off and be legal,whats the difference? If that is in the Cayman Highway Code (does one even exist? ), it needs changing. Once you've pulled on to the roundabout, how the hell are people supposed to know where your 'straight ahead' is? Indicating on roundabouts is simple: taking the first exit (the left), indicate left; any other exit, indicate right (to show that you are going around the roundabout, not to say you are going right), then indicate left as soon as you pass the exit before yours. Then everyone knows exactly where you're going. Simple. Thats correct. You always indicate which ever way you are going. If straight on you indicate right and then left. Please can you teach also the important principle of "keep left unless overtaking" on dual carriageways, thus enabling a smooth flow of traffic rather than clogging up both lanes, thus causing road rage to those stuck behind! should be mandatory for the whole island…good to see a general increase in people using indicators on roundabouts but the overall standard of driving in Cayman is third world at best. I counted at least 10 cars in Fosters carpark with bald/split tires yesterday, it would be an easy few tickets for any cop patrolling the premises looking for defects. I just don't want to be near any of these cars when they have to brake hard in the wet or when they have a blow out! Of course the driving in Cayman is "third world", half of the people on the road have never been behind the steering wheel of a car until they got here. And yes, a GREAtT amount of them are from that side of the world. Its about time. 99% of the drivers out there have no clue how to use the round-a-bout. While you are at it please also teach them that there is something called an indicator which is located on the steering wheel and it is used to tell the other drivers where you are going including using it within a round-a-about. This is much needed . A roundabout accident happened just today @ the Butterfield Roundabout because people are confused about how to properly enter and exit a roundabout.